The Under Secretary of the Army and the Chief of Staff of the Army have approved the following Army 2010 Tactical Wheeled Vehicle (TWV) Strategy. This strategy charts our way ahead to manage the modernization and sustainment of the Army wheeled vehicle fleets. It is an affordable plan to achieve and sustain the capabilities the Army will need for the next 30 years. Our current fleet represents an investment of over $70 Billion and is worthy of our best efforts at intensive management and planning. 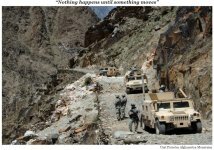 This strategy synchronizes the plans and actions of all Army agencies involved in TWV requirements, procurement, integration, sustainment, and management. It highlights our path for the Army's integration of the Joint Light Tactical Vehicle, the Mine Resistant Ambush Protected family of vehicles, and the modernization of the other wheeled vehicle fleets to provide the protected mobility our Soldiers require. The strategy also lays out the actions the Army will take to adjust fleet size and mix to ensure we provide the Army with the TWV capability it requires at an affordable price. The Army will be faced with many challenges in the coming decades — this strategy will allow the Army to balance the quality, quantity, and cost of its TWV fleet to meet its mission requirements and fiscal responsibilities. With this strategy the Army will field and sustain a modern TWV fleet that ensures our Soldiers have the equipment they need to meet the needs of our nation, both at home and in a period of persistent conflict across the globe. The purpose of this document is to provide the Army with a Tactical Wheeled Vehicle (TWV) Strategy that synchronizes the plans and actions of all Army agencies involved in TWV requirements, procurement, integration, sustainment, and management. This strategy describes the ends, ways and means to achieve an effective and affordable TWV capability for the Army. The following four fleets comprise the Army’s TWVs: Light, Medium, Heavy and Mine Resistant Ambush Protected (MRAP); Armored Security Vehicle and Stryker are not included. The strategy covers the time period of the present through Fiscal Year (FY) 2025 and supersedes the Army 2009 TWV Investment Strategy. This Strategy will inform the requirements process, TWV Acquisition Strategy, Fleet Management Plan (to be published), and the development of the Army Program Objective Memorandum (POM). evolved in the past decade from an unprotected motorized transport to a protected system capable of operating in a full-spectrum, non-linear battlefield. 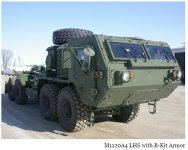 This evolution has resulted in a dramatic increase in truck costs – to meet the threat on today’s battlefields, trucks must now be armored, have the additional capacity and power to carry that armor, and be outfitted with a wide variety of Command, Control, Communications and Computers, and Intelligence, Surveillance and Reconnaissance (C4ISR) equipment. The Light Tactical Vehicle (LTV) fleet provides a good example of this evolution – the High Mobility Multipurpose Wheeled Vehicle (HMMWV) was initially fielded to serve as a light, highly mobile and unarmored vehicle at a procurement cost of roughly $70 thousand when adjusted for inflation. In its efforts to adapt the HMMWV to modern requirements, the Army has increased the performance and protection of the HMMWV, increasing the cost of an up-armored variant to over $160 thousand (over $220 thousand with Fragmentation Kits). This modern Up-Armored HMMWV (UAH), however, still does not fully meet the evolving mobility or protection requirements of our Soldiers. The Army is therefore developing the Joint Light Tactical Vehicle (JLTV) to fill this capability gap. The cost to provide this capability is high – it is estimated that each JLTV will cost in excess of $300 thousand before equipping with essential combat systems – but not as high as the cost of the MRAP Family of Vehicles (FoV) which cost $430 - $900 thousand apiece to procure. This evolution in trucks has coincided with a substantial increase in funding to support the Army’s wartime needs. The Army has spent close to an average of $6 billion/year on its TWVs (not including MRAPs) since FY03, as compared to less than $1 billion/year in the six preceding years. As a result, the Army now possesses greater TWV capability than at any time in recent history. However, capability gaps remain, and the adaptable nature of our enemies continues to stress and challenge these capabilities, necessitating further investment. Without Overseas Contingency Operations funding, the Army budget for TWVs will initially average just over $1 billion/year, slowly rising to back to approximately $2.5 billion/year in the near term. This level of funding will not support the continuation of the current pace of TWV modernization and replacement or recapitalization of the existing vehicles once they reach the end of their Economic Useful Life (EUL). The annualized cost to replace each of our current vehicles every 40 years, with a recapitalization performed mid-way, is over $2 billion/year and over $2.5 billion/year if MRAPs are included. If the Army were to replace all HMMWVs with JLTVs, this would add over $2 - $5 billion/year to these estimates, depending on the procurement rate. The Army therefore finds itself at a strategic crossroads – it must provide Soldiers with the appropriate platforms to meet the threats of today and tomorrow, but it cannot afford to sustain and modernize a fleet of the current size given future budget expectations. The Army must therefore examine its budget, capabilities required, fleet size, and allocation processes to determine a strategy to provide the Army with an effective and affordable TWV fleet. The Army’s objective is an affordable strategy to ensure that Soldiers operating within Army Force Generation (ARFORGEN) have the right balance of vehicle quantities, types and modernization to meet their mission requirements – whether in combat, training, operating as part of the Army’s generating force, or conducting Homeland Defense and Defense Support to Civil Authorities (HLD/DSCA) missions. Forces equipped with TWV capabilities to meet all mission requirements from general purpose trucks to armor- capable and protected platforms with specific functional capabilities. Forces trained to ensure the safe and successful employment of their vehicles. Strategy will be affordable given current budget estimates. Swiftly modernize critical LTV combat platforms to mitigate capability gaps remaining in the LTV fleet not addressed with the HMMWVs and MRAP FoV. Progressively modernize all TWV fleets to improve fleet capability to include reliability and operational readiness and reduce fleet age and operating costs. MRAP FoV integrated into the Army force structure to take advantage of existing systems to meet documented requirements and to reduce operating costs by divestment of duplicative systems. protection provided to deploying forces as required. TWV fleet equipped with sufficient armor-capable vehicles to meet protection requirements of the Available force pool and contingency forces; armor- capable objective is greater than or equal to 50 percent of the TWV fleet. 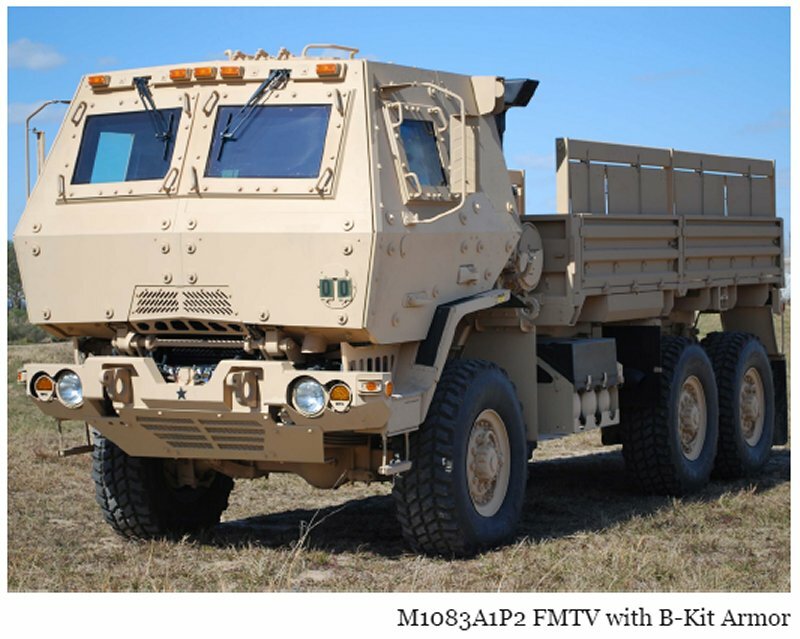 Army equipped with enough B-Kit armor (modern armor kits designed to be installed on armor-capable vehicles) to meet protection requirements of the Available force pool; B-Kit objective is greater than or equal to 30 percent of the TWV fleet. Through competition – promote a healthy industrial base, including government depots, that affords the ability to respond to changing or emerging Army TWV requirements. Technology advancements leveraged to enable the flexible adaptation of TWV platforms. Total ownership cost per vehicle reduced to decrease Army operations and maintenance requirements. Fuel economy improved for new or recapitalized TWVs by 10-15 percent or more from the FY10 baseline to reduce costs and limit personnel and asset risk during battlefield resupply. The expense of providing vehicles adequate to meet the threats of today and tomorrow dictates that the Army must meet its objectives by carefully balancing the quantity, quality and management of its fleet of TWVs. While the Army can meet some of its requirements with carefully targeted increases in funding, it must find cost savings in quantity, and fleet management to improve quality. The following overarching TWV approaches will guide the Army’s plans and actions to achieve those objectives. Strategies specific to the four TWV fleets will be addressed in the subsequent sections. Equip to meet ARFORGEN requirements. Even when the Army has 100 percent of its vehicle requirements, its vehicles will have varying degrees of capabilities and modernization. ARFORGEN is the Army’s process for generating forces and is used as a tool to ensure Soldiers receive the right vehicles, with the right capabilities, at the right time. When less than 100 percent is available, ensure that ARNG Critical Dual Use (CDU) requirements are filled no less than 80 percent in order for them to meet their DSCA responsibilities. Equip Army with vehicle training sets and simulation devices for training during Reset and Train/Ready phases, at a minimum. Emphasize the use of Training Aids Devices and Simulation as a means to mitigate training risks due to reductions in TWVs available for training. Simulation trainers will supplement individual and unit training during the ARFORGEN Reset phase. Benefits will include reduced costs as budgets decrease and fuel price rise, improved safety and accident reduction, commonality and dual use training, and ability to change training rapidly to mirror changes in software/hardware or changes in Tactics, Techniques and Procedures. Shape TWV fleet size and mix to ensure long-term affordability through new procurement, recapitalization and divestment; leverage existing assets to the greatest extent. Reducing overall TWV authorizations by up to 10 percent from the current Structure and Composition System (SACS) authorizations; amount and allocation of any reduction will be determined by Training and Doctrine Command (TRADOC) analysis and approved by the Army G-3. Continuing to support Army Prepositioned Stock (APS) as an Army required capability, but off-set Modified Tables of Organization and Equipment (MTOE) authorizations by the amount in APS as an affordability measure. The Army will fill APS at 100 percent of its requirements and authorizations (approximately 5 percent of current Army TWV requirements), but will reduce the authorizations for the MTOEs of the active and reserve components by the same number and types of vehicles as are maintained in APS. The method of offset will be recommended by TRADOC and approved by the Army G-3. Ensuring that Theater-Provided Equipment (TPE) and Pre-Deployment Training Equipment (PDTE) are not documented as separate, additive requirements; when present each will be filled from existing MTOE inventories. Integrating MRAPs to fill Army requirements IAW Army Campaign Plan Decision Point 147 (DP147) and any approved updates to this plan. Balancing TWV inventories across service components and commands at all levels to fulfill Army requirements and maximize unit readiness. Continuing to adjust supply policies to allow for appropriate substitutions to be made and apply Basis of Issue Plan changes to reduce number of required variants, increasing readiness reporting. Conducting a TRADOC analysis to determine if any portion of the generating force or otherwise non-deployable force TWVs can be replaced with less expensive non-tactical commercial vehicles. Balancing emerging requirements against existing ones to prevent requirements-creep and fleet growth after reductions are made. Implementing recommended reductions, and then procuring and equipping 100 percent of the remaining authorizations. 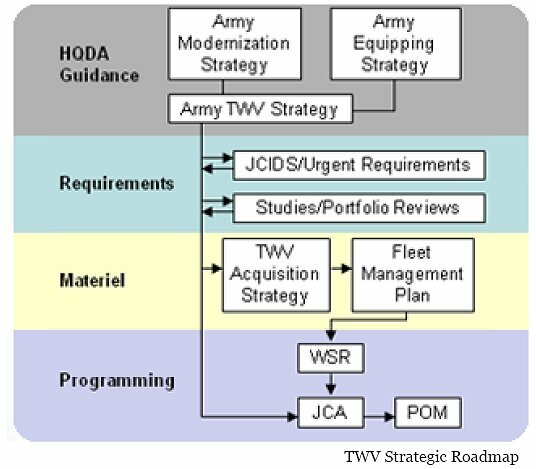 Managing TWV equipping and friction (vehicles unavailable to the force because they are in transportation or reset) using the tenets provided in the Army 2009 Equipping Strategy. Balancing fleet investment costs and fleet age by maintaining the average vehicle age at 10 years old (peak vehicle age equal to approximately 20 years) by replacing vehicles every 40 years and recapitalizing them once midway (when recap is feasible and economically advantageous). Continuing to refine the Army’s divestiture strategy to ensure that the fleet is maintained at the appropriate size; vehicles will fill authorizations or be transferred to fill other requirements/divested. Consideration in the divestiture process must be given to Theater Security Cooperation Programs and Foreign Military Sales as claimants for systems to be divested prior to determination to dispose through the Defense Logistics Agency Defense Reutilization and Marketing Office. Accept three tiers of armor protection through FY25 and likely beyond: unarmored, B-Kit/Fragmentation Kit, and MRAP/JLTV. Use proposed MRAP equipment sets and MRAP/JLTVs to fill selected Data Interchange (DI) requirements to provide MRAP-like protection for deploying forces for the foreseeable future. Data Interchange is the process by which the Army budgets for and procures TWVs for other Army programs to mount their systems on for tactical mobility. Use new procurement, recapitalization and MRAP integration to reach greater than or equal to 50 percent armor-capable for TWV fleet. Procure B-Kits for approximately 1-2 percent of the fleet each year to equip 30 percent of fleet and support industrial base capability to surge production and develop new armor technologies. Maintain B-Kits on specified prepositioned, high-priority and training-unit vehicles and store the remainder at facilities under Army Materiel Command (AMC) management for use as needed. Reduce total ownership costs through implementation of reliability and maintainability improvements, design commonality, and competitive product support strategies in vehicle procurements, component upgrades, and recapitalization. Leverage industry-developed/government mandated fuel efficiency advancements, combined with Army investments in new procurement and recapitalization, to reach fuel economy improvements of 10-15 percent for all vehicles procured or recapitalized in FY25 and beyond. These measures, plus those included in the fleet strategies below, will allow the Army to meet its objectives at the expected level of funding. The TWV fleet is composed of multiple vehicle types and variants to achieve the myriad number of missions tasked to Army trucks. The TWVs are divided into the following four fleets: Light, Medium, Heavy, and MRAP; each of these is covered in greater detail below. 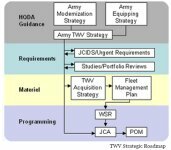 The Assistant Secretary of the Army for Acquisition, Logistics and Technology publishes a TWV Acquisition Strategy that takes its guidance from this Strategy and further describes the Army's methods to acquire and manage the life-cycle of the TWV fleet. 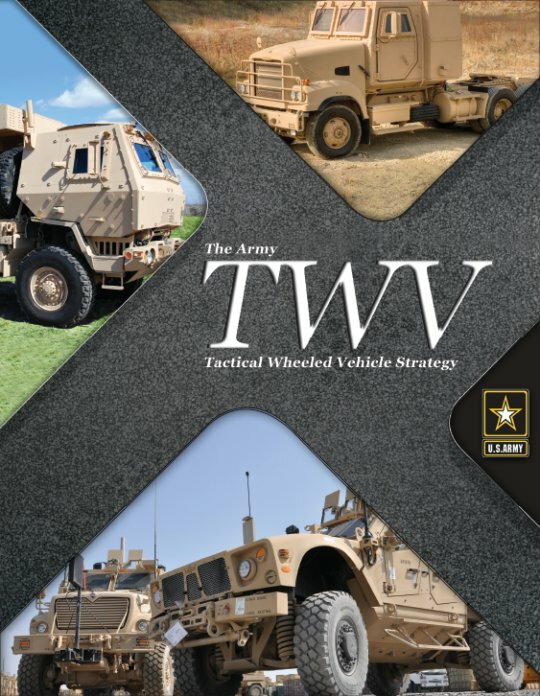 Combined with the Fleet Management Plan published by the Program Manager, Tactical Vehicles, these products provide the detailed strategy and plan for how the Army intends to procure, manage, sustain, and divest its TWV fleet. The Army’s LTV fleet consists of the HMMWV FoV, the JLTV FoV (in development), and associated trailers. For the purposes of this Strategy, LTVs are defined as any vehicle capable of being internally/externally transported by a CH-47F with a cargo capacity equal to or less than 5,100 pounds. The LTV fleet is comprised of three specific mission sets. These are the Force Application (armament carriers), Battlespace Awareness (reconnaissance, C2, and general purpose mobility), and focused logistics (light cargo utility vehicles/shelter carrier/ casualty evacuation vehicles). All mission sets currently have both armored (UAH) and unarmored variants. The HMMWV is currently the Army’s primary LTV; the Army will continue to divest and cross-balance its inventory of HMMWVs to stay at its current and objective number of required vehicles. The HMMWV fleet is out of balance in several areas, to include model-type and modernization. For example, the Army possesses a shortage of HMMWV ambulances while it has more armament carriers than it requires. The level of modernization in each component is also currently not balanced. The Army National Guard (ARNG) has a higher percentage of UAHs in its fleet than the active component despite having fewer requirements, but the ARNG’s overall level of modernization trails both the active component and U.S. Army Reserve because of its lower level of modernized unarmored HMMWVs. CAT A: Payload capacity of 3,500 pounds. Includes the following four variants: General Purpose Mobility (Small Unit C2), Heavy Guns Carrier, TOW ITAS Carrier, and Recon (Armored Scout LRAS3 – 4 seats). CAT B: Payload capacity of 4,500 pounds. Includes the following three variants: Battle Command on-the-Move (Brigade and Battalion) (Increment I), Infantry Carrier (6 seats), and Reconnaissance (6 seats) (Increment II). CAT C: Payload capacity of 5,100 pounds. Includes the following two variants: Shelter Carrier/Prime Mover/Utility (2 seats) and Ambulance (3 seats + 2 litters). 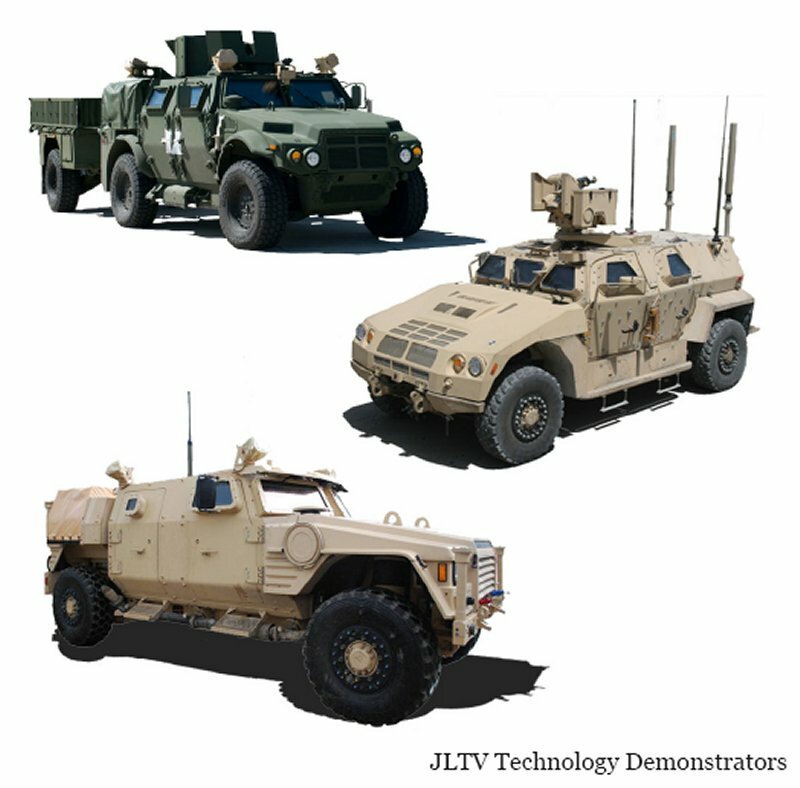 The JLTV is currently in the Technology Development phase and will enter into the Engineering and Manufacturing Development phase 1st Quarter FY12. The Low Rate Initial Production of the JLTV is expected to start no earlier than FY15. The cost per vehicle is not yet determined, but it is expected to exceed $300 thousand without the inclusion of mission equipment. The Army will execute JLTV fielding using an incremental and long-term approach to modernize its LTV fleet that will extend past FY25. Army first unit equipped is expected 1st Quarter FY17. This strategy lays out the priorities for which parts of the HMMWV fleet will be replaced with the first increment of JLTVs and what will be done with the remainder of the LTV fleet. Continue to support the development and fielding of the JLTV and JLTV trailer. The next decision point (Milestone B) for JLTV development and procurement will be made on or about 1st Quarter FY12. Fill roughly one-third of the Army’s LTV requirements (as of Milestone C) with JLTVs, once a procurement decision is made and in accordance with the Capability Development Document (currently in draft). Field initially Category A JLTVs (~70 percent of procurement), Category C (~25 percent) and a limited number of Category B (Battle Command On-The-Move, ~5 percent). The rate of this procurement will depend on funding available but is expected to extend past FY25. Initial JLTV fielding will be to TPE, Early Entry Forces (Special Operations Forces (SOF), Ranger Regiment, Global Response Force (GRF), selected Infantry Brigade Combat Team), Battlefield Surveillance Brigades, PDTE, Combat Training Centers (CTCs) and APS, respectively. A large portion of the MRAP FoVs, including the MRAP All-Terrain Vehicle (M-ATV), will supplement the LTV requirements either as a bridge to fill critical combat roles (until the JLTV is fully fielded and/or the remainder of the MRAP FoV EUL), or as permanent enduring capabilities. The Army is continuing to analyze and adjust these strategies as the development of the JLTV continues. Research and be prepared to apply alternative solutions for the LTV mission sets not replaced with the JLTV or MRAP FOV. Expect to sustain these portions of the HMMWV fleet for up to an additional 20-30 years through the use of recapitalization and depot-level repair. The Army will solicit industry to see what options exist for competitive recapitalization of HMMWVs to improve protection while sustaining or improving automotive performance. Divest HMMWVs that are excess to requirements after all balancing actions are complete. Unarmored will be divested before armored HMMWVs. Divest the High Mobility Trailers (HMT) and older Light Tactical Trailers (LTT) (production prior to 1995) to pure-fleet with newer LTTs. Recapitalize or repair (sustainment repair at depot, if already modernized) HMMWVs returning from theater. Fragmentation Kits and the Objective Gunner Protection Kit (OGPK) will be removed, reconditioned, and stored for future use. An exception will be vehicles placed in Army Prepositioned Stock (APS), PDTE, CTCs and some specific units (e.g. SOF, GRF, etc.) – portions of these fleets will have Fragmentation Kits and OGPK installed and fielded under Urgent Materiel Release. Study and make a determination prior to LTV modernization if armament carriers (HMMWV and JLTV) should be managed as a system of systems. An armament carrier cannot be fully employed in combat unless it has its required armor, C4ISR packages, etc. Transition Army DI HMMWV requirements that exceed the HMMWV payload to either the Medium Tactical Vehicle (MTV) or MRAP FoV platforms by FY15; transition of systems to new vehicles will be complete by FY25. There are currently over 40 Army systems that use the HMMWV as their prime mover of which over half require waivers because their weight exceeds the HMMWV payload. Divest the Army’s remaining Commercial Utility Cargo Vehicles (approximately 2,000). The Army's MTV fleet consists of legacy 21/2- and 5-ton trucks and the Family of Medium Tactical Vehicles (FMTV). The FMTV consists of the Army’s 21/2-ton Light Medium Tactical Vehicle (LMTV), the 5-ton MTV and associated trailers. There are multiple MTV variants to include cargo, tractor, van, wrecker, 8.8-ton load- handling system and 5- and 10-ton dump-truck models. Divesting its aging fleet of M35 2 1/2 ton vehicles, M809-series vehicles and M939-series 5 ton trucks. Balancing the model-mix and Army component levels of FMTVs. Incorporating selected JLTV payload category C requirements into the FMTV requirements documents by FY16. The Army plans to complete the divestiture of all M35s by the end of FY11 and replace all M809-series trucks with the FMTV FoVs by the end of FY12. It will replace all M939- series trucks with the FMTV FoVs no later than FY22, and potentially earlier depending on the return of vehicles from theater and ability to fill requirement holes across each component. Divesting these vehicles will ensure dramatically lower sustainment costs for the Army as many are well past their EUL. These vehicles are not candidates for recapitalization since they cannot be economically modernized through recapitalization. The Army will potentially recapitalize model A0, A1, and A1R FMTVs in the future to extend their service life and fill variant- specific shortages. This will be done if recapitalization can provide the required capability more economically than new procurement. It is not economically feasible to render them armor capable through recapitalization. Currently programmed FMTV procurements will bring the MTV fleet to over 50 percent armor capable by FY18. The Army will repair armored FMTVs (sustainment repair at depot) when required, as they are retrograded from theater; it will repair or divest armored legacy MTVs depending on fleet requirements and vehicle condition. Vehicles with Radian Armor Crew Kits Add-on-Armor (AoA) will have the armor removed, demilitarized and disposed. The vehicle will be returned to its standard unarmored Full Materiel Release configuration. Vehicles with serviceable Low Signature Armored Cab (LSAC) armor will be reset and used to fill requirements for armored vehicles such as in APS; LSAC armor that is not serviceable will be demilitarized and disposed. The Army will replace up to roughly 500 of the unserviceable cabs with LSACs that are currently in storage and position those vehicles in APS; the remainder of those trucks will be returned to their unarmored standard configuration. Long-Term Armor Strategy (LTAS) vehicles will be repaired at depot and their B-Kit armor either maintained on the vehicle or removed for storage, depending on the unit of assignment. The Army’s HTV fleet consists of the Heavy Expanded Mobility Tactical Truck (HEMTT) FoV, the Heavy Equipment Transporter System (HETS), Palletized Load System (PLS), Line-Haul FoV and associated trailers and support systems. The Army’s on-hand level of HTVs is currently at or near its force structure requirements, not including additional requirements in support of theater ONS. The Army’s focus through FY25 is to extend the service-life through recapitalization and modernize older variants to the current armor-capable configurations while reducing sustainment costs by divesting the oldest variants of vehicles and trailers that are excess or replaced by new production. Continue programmed procurements of the HEMTT A4 through FY11. Continue to recapitalize the oldest HEMTT variants and those returning from theater to the A4 variant which can accept B-Kit armor until the armor goals in the TWV strategy are met. Use recapitalization to also balance requirements among HEMTT configurations. Demilitarize and dispose of Generation 1 and 2 AoA. Repair (sustainment repair at depot) and store Generation 3 AoA for future use. Modernize Engineer formations by replacing the M916 Line Haul Tractor with the M983 LET. The LET provides off-road capability and enhanced survivability that the M916 does not. Divest the oldest variants of the Heavy Expanded Mobility Ammunition Trailers which are currently well over 100 percent of on-hand versus requirements; this will allow the Army to improve both fleet modernization and reduce sustainment costs. The PLS is a key Army transportation system and is composed of a prime-mover truck with integral self loading and unloading capability, a 16.5-ton payload PLS­ trailer and demountable cargo beds (Container Roll-On/ Off Platform (CROP)/flat racks). The vehicles can be equipped with material handling equipment, winches, or Container Handling Units (CHUs). The primary mission of the PLS is the rapid movement of combat configured loads of ammunition and all other classes of supply, either containerized or non-containerized. The system also includes a PLS trailer, an Enhanced Container Handling Unit (E-CHU) for transporting 20 foot International Organization for Standardization (ISO) containers, a CROP, or M1077 flat racks. Continue procurement of the PLS A1 through FY11. Recapitalize the fleet as required to extend service life, balance model mix, and update to an armor-capable configuration. Demilitarize and dispose Generation 1 and 2 AoA. Repair (sustainment repair at depot) and store Generation 3 AoA for future use. Cross-level to balance quantities amongst the Army components and divest excess systems as required. Modernize PLS Trailers by focusing on recapitalizing them to integrate the Container Transfer Enhancement (CTE) onto the trailer; the Army is currently reviewing the M1077 flat rack requirements which may reduce the number of trailers to be modernized with CTE. The CTE enables the PLS Trailer to load 20-foot ISO containers without a flat rack. Modernize CHUs with new procurement of Enhanced Container Handling Unit (ECHU). The Army is currently evaluating the requirements for ECHU dependent on the future status of M1077 flat racks in the Army inventory. Continue to procure the M1070 A1, which can accept B-Kit armor, until fleet armor-capable goals of this strategy are met. Conduct depot-level repair of vehicles returning from theater if cost effective. Repair and store AoA for future use. Continue the procurement of the M915A5 Line Haul Tractors and complete the divestment of A0, A1 and A4 variants by FY11. This will fill all Line-Haul requirement shortages with the modernized A3s and A5s as well as a small number (less than 10 percent) of legacy A2s. As a result, the Army will need only limited new M915 FoV procurements to fulfill potential increases in future requirements. Replace the M916 Line Haul Tractor with the M983 LET in Engineer units to provide off-road capability and enhanced survivability. M916s will be retained for some specific requirements and as a substitute for the M920 Line Haul Tractor. Determine any need for a new generation of line-haul vehicles and trailers once the Army completes the process of updating the M915 ORD to a Capability Production Document. Demilitarize and dispose of theater AoA for the A0/ A1/A2/A4 variants. Plan to repair the newest Simula AoA for the A3 variant. The M870, 40-Ton Trailer is a low-bed trailer used by Combat Engineer units to transport Engineer Construction Equipment (ECE) and associated materials suitable for transport. Continue the procurement of the M870 trailers through FY16 and divest the oldest M870 AO model trailers which are excess to requirements; this will allow the Army to improve both fleet modernization and reduce sustainment costs. The M871, 22 1/2-Ton Trailer is a tactical, dual purpose semitrailer that transports break bulk cargo and 20 foot ISO Containers. Divest the A0 and A1 model M871s to meet the Army’s requirements by FY13. The M967 is a semitrailer tanker equipped for bulk transport of fuel. Divest the excess A0 trailers to meet the Army’s requirements by FY12. The M969 is an automotive semitrailer tanker used to dispense fuel. 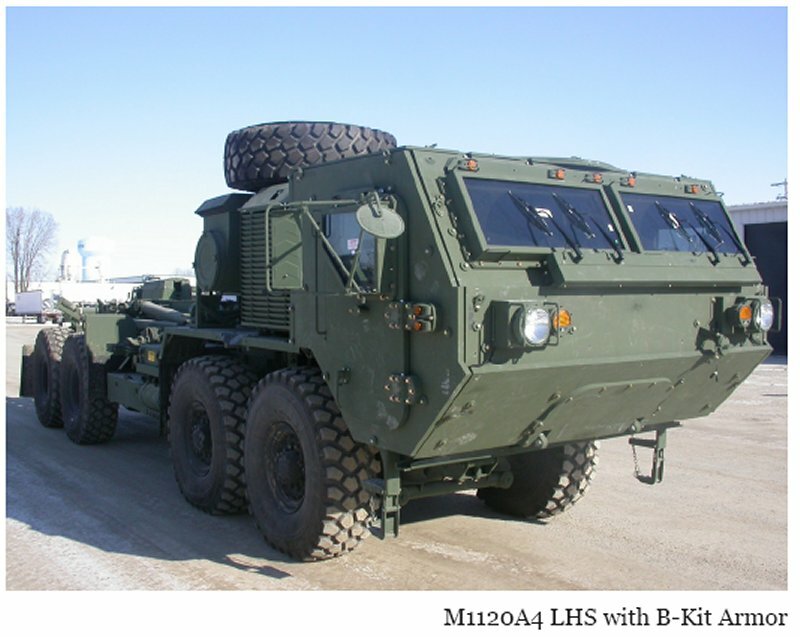 Divest the A0 and excess A1 trailers to meet the Army’s requirements by FY12. The Fifth Wheel Towing Device (FWTD) is a self-contained towing device that utilizes the tractor fifth wheel to allow the tractor to lift and tow disabled vehicles. Divest excess FWTDs to meet the Army’s requirements. The ISRS is a HEMTT LET pulling a modified Fifth Wheel Towing Recovery Device (FWRTD) and a High Mobility Recovery Trailer (HMRT). The HMRT has a 30-ton payload carrying capacity, pulled by the FWTRD with a 16- ton lift capacity. The system was designed to lift, tow, and transport damaged Strykers and has also been authorized by the Army to support MRAP FoV recovery. This system is not a program of record and has been procured and fielded to support urgent Army requirements. The Army will decide in the next Capabilities Development for Rapid Transition review if this system will become a program of record. If it does, the Army will document it as part of its force structure. If the Army determines that the system has not met its desired operational capabilities for Stryker and MRAP recovery, it will continue to develop next-generation solutions. CAT I – Used for combat operations in urban or confined areas that include mounted patrols, reconnaissance, security, convoy protection, communications, C2, Explosive Ordnance Disposal (EOD), and CSS; carries up to seven personnel. CAT II – Used for ground logistics support operations that include convoy security, troop and cargo transport, limited combat engineering and EOD support, casualty evacuation, and ambulance; carries up to 11 personnel. CAT III – Largest of the MRAP FoV, primarily used for mine/improvised explosive device clearance operations that include route clearance; carries up to six personnel. M-ATV – Used for combat operations in complex and highly restricted rural, mountainous, and urban terrain. 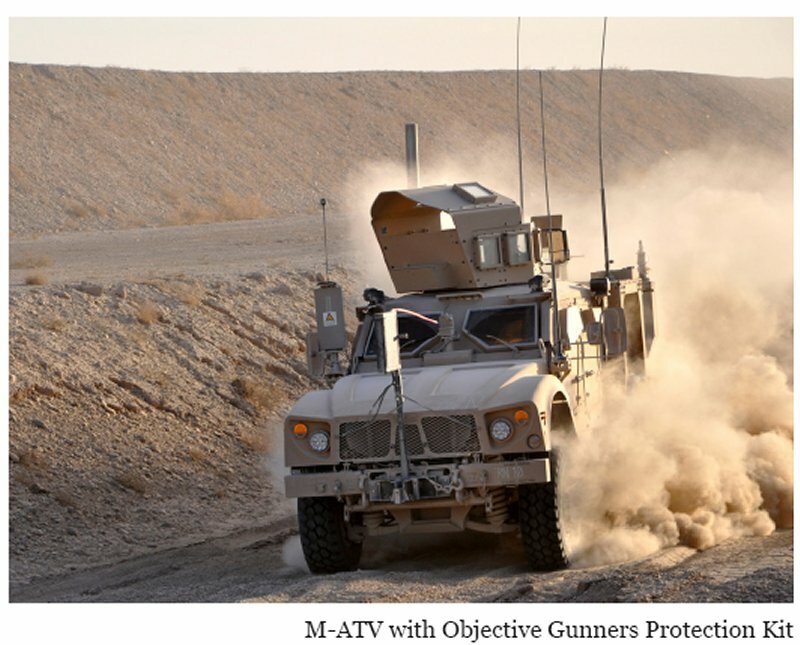 The M-ATV provides better overall mobility characteristics than the original CAT I, II, and III MRAP vehicle variants and provides better survivability characteristics than any variant of HMMWV. The M-ATV supports mounted patrols, reconnaissance, security, convoy protection, casualty evacuation, DI and C2 functions; carries up to five personnel. Document MRAPs, as appropriate, as part of the Army force structure. 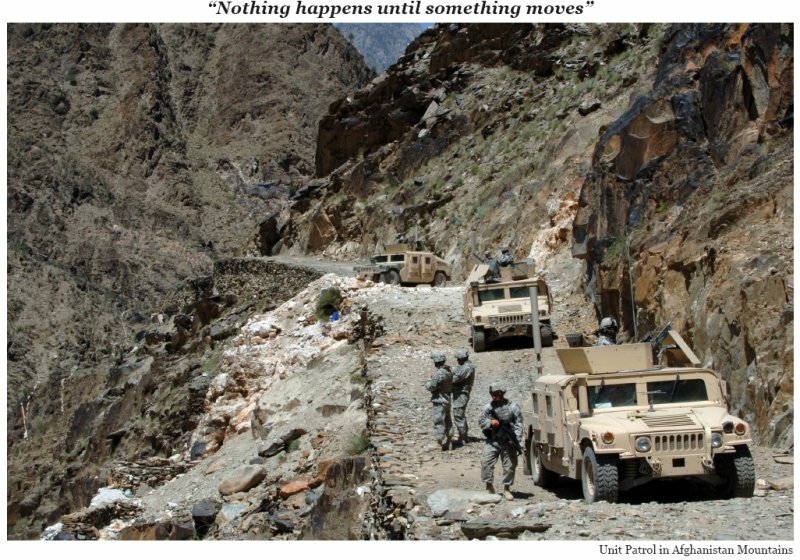 Be prepared to transition MRAP program to Army pending decision of the Office of the Secretary of Defense (OSD) for Acquisition, Technology and Logistics. Develop, resource, and execute a plan for the MRAP FoV to achieve Full Materiel Release and Type Classification “Standard” before actual force integration. Fill existing requirements in units including Sustainment Brigades and Medical, Route Clearance, and EOD units.Armored, armor- capable, and unarmored levels. Be placed in 20 task-organized BCT sets. Five of these sets will be collocated with APS, eight will be at Charleston, SC, and seven will be at Sierra Army Depot, CA. Be used as part of PDTE and CTC training fleets. Be maintained as Sustainment Stocks and War Reserve. Include all MRAPs currently procured and on contract. Incorporate MRAPs into MTOEs as feasible. Divest MRAPs when capability is either not required or can be provided by a more cost effective system. Avoid new military construction to the extent possible. Factor potential use of MRAPs in the Ground Combat Vehicle and other portfolios. Execute MRAP decisions made in the Army Campaign Plan DP156 regarding positioning of MRAPs/M-ATVs in APS. Work closely with OSD and the MRAP Joint Program Office to recapitalize the MRAP variants selected for retention in the final MRAP Study II. The recapitalization will incorporate upgrades and standardize variants as vehicles are retrograded from theater. Once complete, do not further procure or recapitalize any of the MRAP FoV unless selected as enduring capabilities/ requirements. Repair MRAPs as necessary until they reach their EUL. Prepare to transition MRAPs to support former HMMWV and other DI requirements as Program Managers for other Army systems develop solutions for systems that need greater payload and protection than can be provided by their current platforms. Prepare to transition MRAPs to support ambulance requirements and other portfolio requirements (M113, etc.). Develop and field an improved MRAP recovery system, contingent on the acceptance of the ISRS. The objective of TWV protection is to enhance the survivability of occupants by synchronizing a variety of complementary force protection and survivability initiatives in support of current operations and future modernization. To achieve this objective, the Army will pursue a holistic set of measures that incorporate not just materiel solutions, but the entire Doctrine, Organization, Training, Materiel, Leadership and education, Personnel and Facilities (DOTMLPF) spectrum. While this effort focuses on armor levels, the materiel solutions pursued by the Army are not limited to just that – they also include many other non-armor capabilities including crew protection systems, passive and active countermeasures, visual and interrogation aids, etc. As the enemy adapts their techniques, tactics, and procedures to our capabilities, the Army must continue to evolve its protection capabilities to maintain its current superiority in TWV protection. This effort must be supported and funded to the same extent as any program other in light of the importance of this mission. The Army has established a unique funding line for TWV armor solutions to provide transparency to this effort. LTV: Procuring JLTVs and using, where acceptable, the MRAPs/M-ATVs as substitutes for HMMWVs per MRAP Study II. MTV: Continuing the programmed procurement of FMTVs. HTV: Continuing HEMTT and PLS recapitalization and limited new procurement of HETS A1s, M915A5s, and M983 LETs. The TWV Strategy establishes an affordable and operationally-informed level for procurement for B-Kits. We expect technology to continue to provide increasingly effective armor and will therefore only procure a limited quantity of B-Kits each year. Procuring B-Kits incrementally will both reduce annual costs and ensure that the Army is purchasing armor with the latest technology advancements. The Army’s FY25 objective for B-Kits is to have kits on hand to equip 30 percent of all TWV fleet requirements. This objective is set to fulfill the requirements of all deployed forces, non-deployed units in the “Available” pool (including the GRF), high priority units (theater committed, SOF, etc. ), and APS. Armor storage, and maintenance while in storage, will be the responsibility of the AMC. The Army will store B-Kits at several storage locations until needed. When missions require B-Kit level protection, the armor will be shipped to either the port of debarkation or the vehicle home station, dependent on the specific situation. The B-Kits will be installed once the vehicles and armor are linked-up at the designated location. Upon mission completion, the B-Kits will be removed, refurbished, and stored for future use. Armored vehicles (B-Kit installed) will be consolidated at key units and locations. These will include APS, CTCs, TPE and PDTE (when present), and some specific units (e.g. SOF, GRF, etc.). Armored assets will not be moved amongst units at different posts whenever possible to minimize friction and costs. The Army will position B-Kits for one BCT at a Forces Command designated location in support of the GRF. The assignments of BCTs to the GRF mission will be planned to minimize volatility caused by the transportation of armor or armored vehicles when the mission is passed to the next unit. Manage vehicle armor in accordance with the HQDA G-4 2009 TWV AoA Sustainment Policy. To synchronize the protection effort, TWV force protection and survivability requirements will be documented in future approved Joint Capabilities Integration and Development System documents. The Army must seek the necessary funding to support this TWV Strategy. The amount will vary to meet specified annual requirements, but for planning factors we have used an investment value of no less than $2.5 billion/year through FY25. The requirements for investment funding will increase above this amount after FY25 as a greater percentage of the TWV fleet nears its EUL and will require recapitalization or replacement. The JLTV will have a significant role on the objectives of this Strategy and resources required to support it. The JLTV is currently scheduled to begin production in FY15, with first unit equipped in the 1st Quarter of FY17; any significant delays to this will drive changes in funding both for the JLTV as well as vehicles that currently support the LTV missions (HMMWV and MRAP/M-ATV). It is critical that the Army takes the necessary actions to promote, through competition, a healthy industrial base and depot capability to support the research, production, and recapitalization elements of this strategy. Key amongst these actions is the availability of the industrial base to surge to meet increased armoring requirements as the threat situation dictates. A significant risk to this strategy is the availability of procurement funds for the TWV fleet. If procurement funding for TWVs is less than forecasted, the Army will be required to make difficult tradeoffs among cost, schedule and performance to optimize our TWV investment at that point in time. This would, in turn, create increased operational risks. This strategy does not attempt to cover each of the “what-ifs” in funding availability as there are innumerable combinations of measures the Army could pursue. The Army will instead continue to provide the necessary information to the OSD and the Executive and Legislative branches to inform them of the Army’s needs to support its given missions and any risks it foresees so that our government can make informed funding decisions. Providing the right vehicles, at the right time and place also poses significant challenges and risks given the reductions contained in this strategy. The application of this strategy requires follow-on studies by TRADOC to determine what changes need to be made to force design, unit authorizations, or both. These reductions will increase friction and will require the Army to employ both ARFORGEN management and other equipping strategies, such as pooling and offset of selected MTOE authorizations, to ensure that units are equipped with the necessary capabilities to accomplish their missions. The Army has received funding over the last seven years to improve extensively the capabilities and health of the TWV fleet. The current and future risks are to our continued ability to procure and sustain the vehicles with the right capabilities. The key capability challenge today is striking the optimal balance among protection, payload, performance, and affordability for the LTV fleet. The Army has mitigated the survivability challenges with the MRAP FoV and improved mobility significantly with the M-ATV. The key to overcoming this risk with a vehicle that meets all of the Army’s protection, payload, performance, mobility, and transportability requirements is to continue to develop and field the JLTV. This strategy purposely moves slowly to increase armor- level objectives for the reasons of both cost and the rate of improvement in armor and other protection enhancements. This slow rate of procurement presents a risk that the Army may not have the desired level of armor-capable vehicles and/or B-Kits to meet an unexpected occurrence of simultaneous major engagements. This risk is acceptable, however, because the strategy provides enough armor to counter the current capabilities of any peer or near-peer adversary. Should any nation or other actor begin to increase their threat posture, the Army must leverage the industrial base to increase armor production to keep pace with this threat. The Army also ensures that by buying some armor each year, it will continuously be improving the quality of the armor it has as well as promoting an industrial base capability to maintain production capacity and continue to develop improved armor technologies. Because there is no Army HMMWV procurement planned beyond FY10 (with deliveries through FY11) and the initial procurement of the JLTV may be at a low rate and in small numbers, the Army runs the risk of being unable to support near-term LTV DI requirements. To mitigate this risk, the Army will either support near-term LTV DI requirements with recapitalized HMMWVs or instead migrate the DI systems to the LMTV/FMTV or MRAP FoV when a larger payload is required. The Army of 2010 is engaged in a period of persistent conflict in multiple theaters – to meet the highly adaptive threat we face, the Army must provide an increasingly sophisticated TWV capability for its Soldiers. However, the Army is also on the downward side of a phase of increased funding to support fleet growth and modernization. As a result, the Army of the next 15 years must adapt its TWV fleet to meet the threats of today and tomorrow, with reduced funding as compared to the past seven years. Continuing the development of the JLTV and procuring enough to field critical LTV combat roles. Integrating the MRAP FoV into the Army force structure as a bridge to JLTV. Moving at a deliberate pace to achieve the armoring goals of this strategy. Extending the service life of its vehicles. Selectively reducing fleet authorizations and employing ARFORGEN management and equipping strategies such as vehicle pooling to ensure units have the right capabilities for their missions. With these measures the Army will procure and manage a modern TWV fleet with the quality and quantity required to ensure that Soldiers are equipped with the right vehicles and the right capabilities, at the right time.